It’s that time for 69 again. 69 things, thoughts, musings, and anecdotes from Week 2. In honor of this column, Congrats to Gronk on career TD Number 69! Tom Brady against the Saints defense is unfair, especially to owners playing against him last week. Brandin Cooks is gonna explode one week soon but you have to start him every week and take the bad with the good. The Saints offense hasn’t had that great week yet. They will probably have to wait at least one more week. Carolina’s D is strong. Matt Ryan and the Falcons offense looks as good as last year. Devonta Freeman is gonna have a lot of big games for the 3rd straight year. Tevin Coleman is a safer play most weeks than about 2/3 of the starting RB in the league. If Ty Montgomery avoids injury he is going to finish the year as a top 5 RB in PPR. Davante Adams may return to last years level of play if Jordy or Cobb miss time. The people that drafted Michael Crabtree is the mid rounds are going to be a lot happier than the people that drafted Amari Cooper in the first 3 rounds most weeks. Marshawn Lynch is gonna have a stretch soon where he scores a lot of Touchdowns. Jermaine Kearse is the Kenny Britt of this year. It’s gonna be ugly but he’s gonna have 1000 yards and 7 or 8 TDs. The lack of a running game in Philly should keep Carson Wentz as a QB1 for most of the year. Kareem Hunt is the overall RB1 right now and there’s a better than 50% chance he finishes the year that way. There might not be 10 good offenses in the league right now. Now is the time to sell if you have Sammy Watkins in a redraft. Todd Gurley is going to pay dividends for anybody that didn’t believe the terrible Trent Richardson 2.0 narrative. It’s not always gonna be pretty but the role and touches equal points. Sean McVay seems to be a QB whisperer. That isn’t good news for Kirk Cousins owners. People hyped John Brown all offseason. His injury has made room for JJ Nelson to exceed in that role. Chris Johnson’s role should get bigger over the next few weeks. If you can still get a bag of Doritos for Carson Palmer do it now. People in the Dynasty community hate Jarvis Landry for some reason. Keep drinking that Haterade while he catches 110 balls. Jay Cutler, Jared Goff, and Trevor Siemian are all perfect examples of why to wait on QB in your drafts. These guys are still on the waiver wire in lots of leagues. Trevor Siemian being the QB1 after 2 weeks reminds me of that run Kyle Orton had with the Broncos earlier this decade. I think any “expert” that ranks Russ Wilson as a Top 5 Fantasy QB should be forced to start him every week. Jimmy Graham rose from the dead last year.I guess that’s over. Chris Carson looks like he is emerging as the lead back. It might still be a few weeks until it is official. Carlos Hyde is one of only 6 or 7 RB in the league that is getting every touch in his backfield. Even on a bad team that is very valuable. After 2 weeks the TE1 is Jason Witten. He is very capable of having a Tony Gonzalez in his twilight type of season. Zeke Elliott is starting to scare me as a long-term talent in this league. Dez Bryant is seeing plenty of targets. The chemistry between him and Dak Prescott is still a work in progress. CJ Anderson is a very dangerous runner when he has everything going. Demaryius Thomas and Emmanuel Sanders don’t get mentioned as much as they should for best WR duo in the league because they are. Jay Ajayi’s first game of the season should be very encouraging for people that believed in his talent. Melvin Gordon is another one of those RB that is getting every touch in his team’s backfield. There aren’t many of those guys in the league. I’m not a religious man but I say a prayer for Keenan Allen every night that he gets to play a full 16 game season this year. When he’s on the field he accumulates numbers like very few Receivers in the league. Congratulations are also in store for Antonio Gates on breaking the record for TDs by a TE. Now please see the bench and let Hunter Henry bloom like the flower he is. Matthew Stafford is proving Mo Money No Problems right now. There are a lot of bad Offensive Lines right now. The Giants Offense has been as bad or worse than the Jets through 2 weeks. Paul Perkins was a hot sleeper pick before the year…ouch. I’m not ready to say OBJ isn’t gonna have a good year but I’m starting to warm up to the idea. Brandon Marshall has entered the Andre Johnson with the Colts portion of his career. The Redskins went from a fantasy paradise to a fantasy wasteland almost overnight. Chris Thompson has always been a good receiver. Even though he isn’t ever going to get 3 down work he should still be a viable flex option. Samaje Perine has to show me something before I can trust him. Terrelle Pryor is not shedding the One Year Wonder label so far. The Steelers are good. Not much fantasywise to say about them though. The good players are still good. I hope for Adam Thielen and Stefon Diggs sake that Sam Bradford can play most of the season. It might be hopeless though knowing Sammy B’s injury history. I’m officially worried about Jordan Howard. I do think he may be injured though. Tarik Cohen is gonna be in a lot of positive game scripts for his skill set. There isn’t a Bears Wide Receiver that needs to be rostered at this time. Frank Gore is still doing Frank Gore things. If you used a high draft pick on TY Hilton you are probably not happy right now. Jack Doyle seems like he is the pass catcher to own in Indy until Andrew Luck is back. Derrick Henry is knocking on the door in Tennessee. I have a feeling that Demarco Murray will respond this week. I have a feeling we are gonna see a vintage Balek Bortles game this week. By vintage I mean down 21 in the 2nd quarter and a few garbage time TDs. The Ravens D is nasty. Buck Allen is gonna be a high end RB2 in PPR until Woodhead gets back. I’d almost bank on 15 points every week for him. Ben Watson is about to enter the TE1 range very soon. While the Ravens TE doesn’t have the upside of a top TE the floor is gonna be 8-10 points. Injuries stink in fantasy football. Isaiah Crowell owners, this is the week to start him and then sell him. I have nothing to say about the Bengals. Deshaun Watson isn’t ready to be a star in the NFL in 2017. That being said I’ll take watching him over watching Brock Osweiler and Tom Savage any day. Good debut for the Bucs last week. If you can buy Doug Martin before his suspension is up I would advise it. The Panthers have a very ugly 2-0 record. The good thing is their Defense is back to 2015 level of play. This could be the Christian McCaffrey breakout game. You can repeat this for anybody that plays the Saints. You know the Saints Defense is bad when people are picking up Devin Funchess in your fantasy leagues. Jared Cook dissapointed in a prime matchup last week. I copied and pasted this from the other 75 times he’s done that. Well I hope that 69 was as good for you as it was for me. As always I’m your Sweet Fantasy. 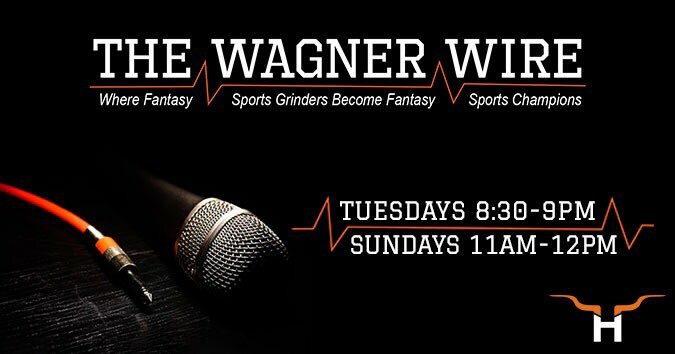 Don’t forget to listen to The Wagner Wire Live on Tuesday’s at 9:30PM EST and Sundays at Noon EST. Stream it live on hornfm.com or the 104.9 The Horn App.